In an Italian restaurant near the New York City Criminal Court Building, Detective Adam Flint is brooding about the nature of guilt. “I deal with guilt every day, and it’s been years I thought about what it really is,” he muses to his actress fiancée Libby. At this moment, Detective Flint has good reason to wonder. He’s in the restaurant during the lunch recess of a murder trial—the re-trial, actually, of a thief and murderer named Joseph Creeley. Detective Flint apprehended Creeley years earlier, in a violent confrontation that followed Creeley’s robbery of a jewelry store. In the course of the robbery, Creeley killed the old man who owned the store and permanently crippled his widow. Flint is a prosecution witness in this trial, as he was in the previous one that sent Creeley to death row. But this time, Flint is hoping that the defense will prevail. You see, shortly before Creeley’s scheduled execution, doctors found a tumor growing in the criminal’s brain. When they removed it, they also removed the past 10 years from Creeley’s memory, as well as the violent impulses that took over his life in the months leading up to the robbery. Creeley’s defense attorney is arguing that the tumor caused that violent behavior—that the tumor, in fact, was the real murderer. 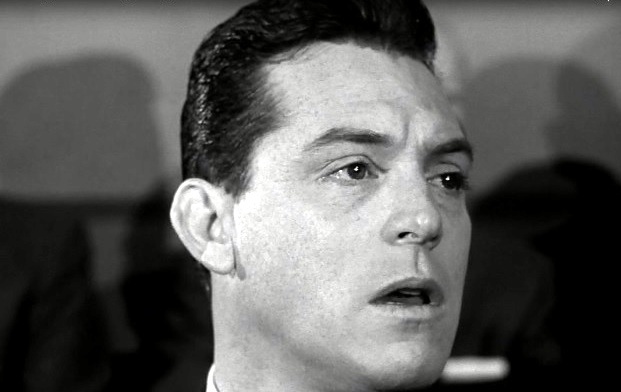 This kind of complicated moral dilemma is a defining feature of Naked City, which began life as a half-hour series based closely on the 1948 Mark Hellinger film of the same name. John McIntire recreated Barry Fitzgerald’s role as the wise and experience Lieutenant Muldoon and dimply James Franciscus played rookie detective Jimmy Halloran. 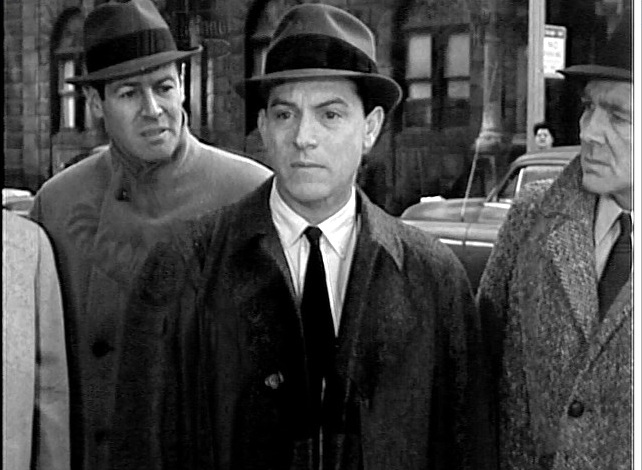 Like the motion picture Naked City, the series filmed in New York City, largely on the city’s streets. Critics embraced it from the beginning. The show died after one season. Producer Herbert Leonard and frequent writer Stirling Silliphant went on to create another acclaimed series, Route 66, then got the green light to revive Naked City in an hour-long format. This version aired for three seasons, and its 1963 cancellation surprised its cast and outraged critics. 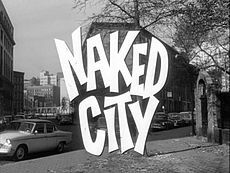 In a way, though, it seems fitting that Naked City died when it did, before the assassination of John F. Kennedy ended the brief era of idealism it represents, and before the rapid cultural shifts of the late 1960s polarized our national discourse in ways that still reverberate today. Naked City’s vision of the human experience is as complex as the city in which its stories unfold, as varied as those 8 million people who populate it. Since this is the Classic TV Detectives Blogathon, I prepared by focusing on the detectives themselves. This isn’t easy because Naked City does not dwell on its officers’ backstories and personal motivations. In Season One, we get occasional glimpses of Detective Halloran’s wife; she mostly waits at home and worries about him. Subsequent seasons give a more substantial role to Detective Flint’s fiancée Libby, who’s living a proto-That Girl life as an aspiring actress. 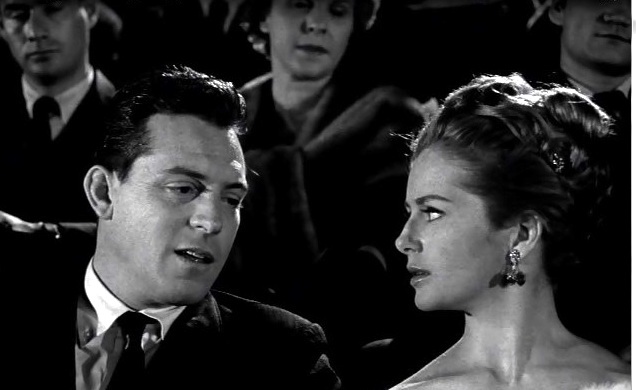 Nancy Malone imbues Libby with warmth and intelligence, and she and Paul Burke make Libby and Adam a believable couple. Libby still mostly exists to be a sounding board and solace for Adam, though. Adam and Libby in their typical attitudes–he worrying about work, she worrying about him. Those are the words that Joseph Creeley mutters as he awakens after surgery and finds a 10-year void in his memory. Struggling with the nature of guilt, Adam repeats these words during his lunch with Libby. His ability to see so many sides to an issue frustrates him, although Libby assures him it’s one of his finest qualities. This is one of Naked City’s finest qualities, too. Its stories evoke a measure of our sympathy for nearly every character, even those we first encounter during brutal acts of violence. Consider this 10-minute opening sequence from 1961’s “Requiem for a Sunday Afternoon.” We feel the wronged husband’s pain but can’t see the young man dragged into this situation (Burt Reynolds!) as a villain. We can even find some understanding for the wife, trapped in a marriage she never wanted. 2. When you want to know who you are, look inward. In “Bullets Cost Too Much,” Adam endures the shifting winds of public opinion. Paying a visit to a bar that hasn’t been closing on time, he witnesses an armed robbery. 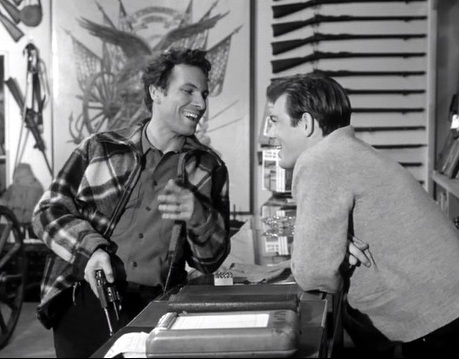 A mouthy drunk gets in the thieves’ way and gets shot, while Adam sits and watches, unable to intervene without endangering other bar patrons. The thieves get away, although Adam shoots one during the escape. The jeering crowds that gather around Adam even toss out the ultimate Cold War-era insult, likening him to Communist security forces. In a parallel story, the doctor brother of one of the thieves struggles with his conscience as he treats the wounded man and avoids alerting the authorities. 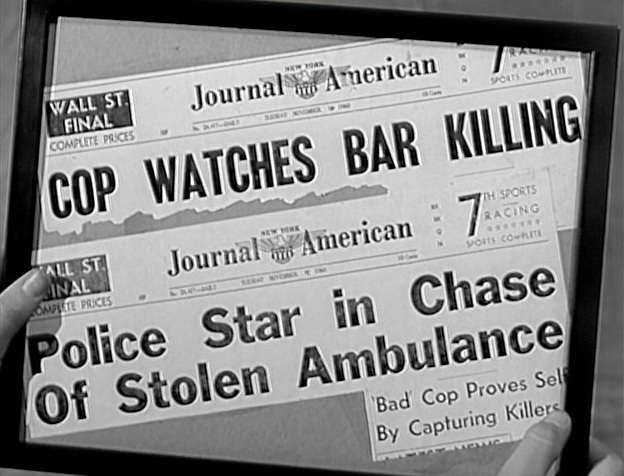 In the end, Adam helps capture the thieves and earns headlines as glowing as previous ones were critical. Libby frames both to remind Adam to rely on his own sense of integrity, rather than external assessments. Adam’s reverence for life faces its toughest test in “Prime of Life” when Lieutenant Parker orders him to witness an execution. As moments pass slowly in the death chamber, Adam has flashbacks to the condemned man’s crime, as well as to his own agonized soul-searching in the weeks leading up to the execution. Naked City rarely attaches labels or diagnoses to its criminals, but a lack of human connection seems to drive many of them. In the first-season episode “ And a Merry Christmas to the Force on Patrol,” an officer subbing for Detective Halloran on Christmas Eve gets shot during a liquor store stake-out. One thief, Marco, is captured, but he refuses to help police identify or locate his brother. Halloran is shaken and angry, but Lieutenant Muldoon takes a softer approach. When Marco learns that his brother was shot while fleeing, Marco breaks down and tells Muldoon where to find him. Later, Muldoon has to return to Marco’s cell to inform him that his brother died before police got to him. Marco, shattered that his brother died alone, reaches out to the only person can—Muldoon. “We are all responsible for each other,” is what Adam tells Libby after the Joseph Creeley case goes to the jury. She doubts whether she could handle the responsibility of deciding a man’s fate, but Adam argues that judging and being judged is part of our human compact. 5. There are no easy answers—and sometimes no answers at all. 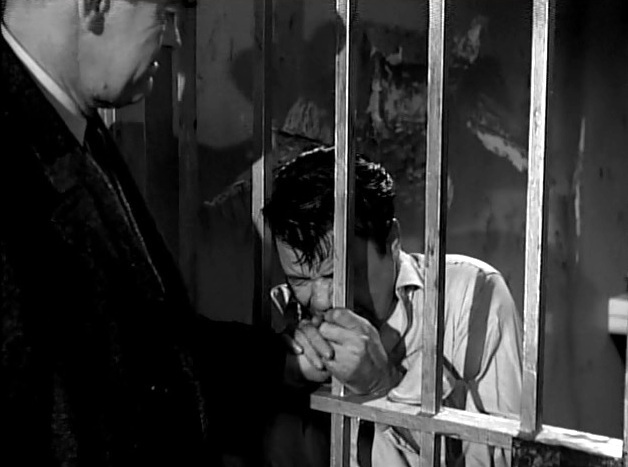 Naked City doesn’t paint criminals as monsters, but it does not downplay crime’s horror. When violence erupts on this show, it is usually sudden and brutal. The 1962 episode “A Case Study of Two Savages” has a particularly high body count. Arkansas’ Ansel Boake (Rip Torn) arrives in New York with his teenage bride and begins shooting everyone who gets in his way. This includes Detective Frank Arcaro, who merely stops to tell the youth that his license plate is loose. This gun store owner, relishing Ansel’s country bumpkin humor, has only a few seconds left to live. A convalescing Arcaro tells Adam to find out why the young man shot him. When police finally catch up with Ansel and kill him during a bank robbery, his wife (Tuesday Weld) can’t offer much of an answer. “Just for the hell of it, I guess,” she says. Halloran ends up shooting his neighbor; before dying, the man rambles semi-coherently about mankind’s failures and the need to begin again. We’re left with narrator’s observation that sometimes there are no answers, at least not comforting ones. We get no answers in the Joseph Creeley case, either. After the jury gets the case, Adam and Libby leave it and the New York Criminal Court Building behind. Due to his faith in the jury system, Adam conveys a renewed sense of peace. My first reaction on watching this episode was annoyance that we didn’t learn the jury’s decision. Then I realized that this story’s thorny moral dilemma doesn’t lend itself to a simple answer—it is something viewers need to think through for themselves. 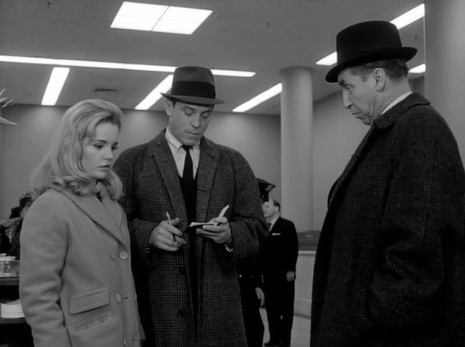 In the world of Naked City, asking questions is more important than finding answers. 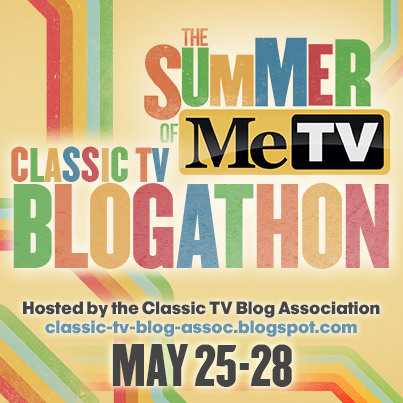 Read more entries from the Classic TV Detectives Blogathon. 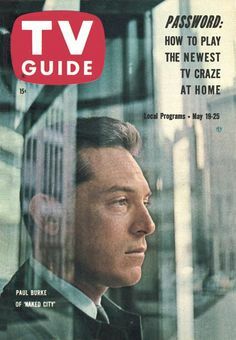 This entry was posted in Television and tagged 1950s, 1960s, Blogathon, Classic Television, Classic TV Blog Association, Detective, Frank Sutton, Harry Bellaver, Horace McMahon, James Franciscus, John McIntire, Naked City, Nancy Malone, Paul Burke, Rip Torn, Television, Tuesday Weld. The guest casts, the location filming and the themes of individual episodes make “Naked City” not only interesting viewing, but give the series a vibrancy that belies its age. Excellent article. I’m glad you liked it. So many aspects of Naked City fascinate me that it was hard to pick a topic. Thanks for commenting! I consider Stirling Silliphant one of the great writers of classic television. He was masterful at conveying the moral dilemmas you described and, though his dialogue never sounded realistic, there was an almost poetic quality to it. James Franciscus and Dorothy Malone were also terrific in their later series MR. NOVAK and PEYTON PLACE, respectively. I have seen snippets of NAKED CITY, enough to also appreciate the terrific on-location NYC photography and the cool title theme. I noticed there are several episodes on YouTube (nice for me!). Yes, there are some episodes on Youtube, and seasons 1 and 2 are on Hulu for subscribers. It’s worth digging into. I know what you mean about Silliphant’s dialogue–it’s definitely not naturalistic. Both the writing and acting on Naked City are a bit more “theatrical” than anything you would find on TV today. Just to clarify, it is Nancy Malone and not Dorothy Malone in Naked City. Nancy Malone had an interesting history in television; when she got tired of the limited roles available for women, she broke into producing and directing. Wait – where do Buffy and Jody fit in? 🙂 Great piece – I really enjoyed your take on a very different series from what you often cover so well here. Ha! It’s funny to think that Naked City and Family Affair take place in the same city, within in the same decade. Talk about different universes! Great essay. I loved that you worked in the Christmas episode too! Your piece made my head spin with how influential this series is on cop shows and detectives on television ever since. Thank you. Great show. Liked it back then, love it now. 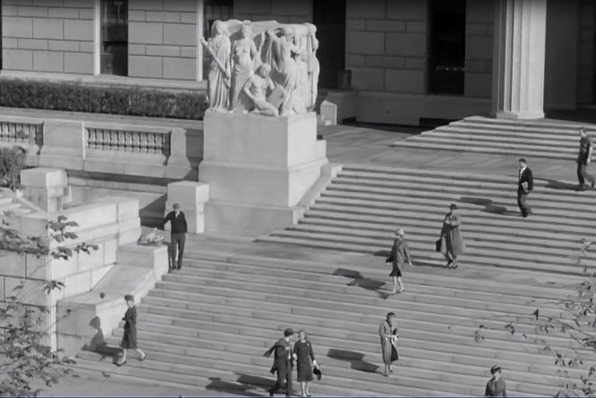 BTW, the courthouse seen In “A Case Study of Two Savages” is the Bronx county courthouse 158th St entrance. Excellent piece, Amy. I’ve really gained an appreciation for Naked City in the last couple of years. It presents a much different – and better – portrait of police shows than the procedurals on TV today. And a great idea to focus on the detectives – since the episodes spend so much time developing the characters of the incidentals – the criminals, the victims, etc. – that we can sometimes forget just how good Adam, Frank, Mike, Jimmy, Dan are at their job. Terrific episodes you chose as well.